The 45th President of the United States will be Donald J. Trump. That’s right, much to the surprise of many people, TRUMP! Almost all TV networks, research institutes, experts, pundits, political analysts, professors, doctors, and all others who make up public opinion said that Trump was virtually finished and would have very little chance of victory. They wanted Trump to confirm whether he would accept the inevitable defeat if possible give the election to Clinton without a vote, a mere formalism in their view. Today, all we see are those eager to predict the victory of former Secretary of State during President Barack Obama’s term, Mrs. Hillary R. Clinton, excusing themselves. The famous “mea culpa, mea culpa, mea máxima culpa” was abundant. And literally was the title of an apology email Sobato’s Crystal Ball, a research center at the University of Virginia. It looks like their crystal ball was a little blurry. I think the difference between the poll numbers and the votes counting denounces something rotten in the Danish Kingdom. Such a difference was scattered to the four winds, 24×7, seven days a week, for months, throughout the media. This is already a clue for you to begin to understand the scale of this victory. During the coverage, journalists and anchors of CNN and MSNBC showed their surprise as the numbers of the reality were appearing. But what’s the reason for such astonishment? One can say it is because of the: difference between forecasts made and the final results, repudiation of part of the population to Trump, scorn directed by the press to the candidate, so many celebrities who mocked the entrepreneur, indignation of illegal aliens and contempt of hipsters. Anyone who is surprised by Donald Trump’s Victory must live: in a bubble, under a rock, way off somewhere in the clouds or a dream world. But it seems that most journalists, pundits, and experts live there because they couldn’t see it coming.The warning signs of victory were everywhere. In the international scene: Macri’s victory in Argentina, Brexit in Europe, the vote against the Labor Party in Brazil, opposition progress in Venezuela and the growth of the Right and Conservatism are plenty evidence. The warning signs of victory were everywhere. In the international scene: Macri’s victory in Argentina, Brexit in Europe, the vote against the Labor Party in Brazil, opposition progress in Venezuela and the growth of the Right and Conservatism are plenty evidence.Nationwide, it’was just about talking to people and listening to what they were saying, seeing the displaying of enthusiasm at Trump rallies and his results on the primaries. Of some black people to whom I asked what their thoughts about brother Obama in the presidency were, I have always heard, shy, evasive, or vague answers. If Obama administration that only left the blacks worse in the last eight years could not inspire the electorate, how could he expect a vote of continuity of this group for Hillary? Nationwide, it’was just about talking to people and listening to what they were saying, seeing the displaying of enthusiasm at Trump rallies and his results on the primaries. Of some black people to whom I asked what their thoughts about brother Obama in the presidency were, I have always heard, shy, evasive, or vague answers. If Obama administration that only left the blacks worse in the last eight years could not inspire the electorate, how could he expect a vote of continuity of this group for Hillary?Not even the unconditional support of the press working in the service of Hillary’s campaign was able to aid this pathological project of power. Even listening to lies, distortions and inventions of all kinds about Trump the people did not swallow the bait. Not even the unconditional support of the press working in the service of Hillary’s campaign was able to aid this pathological project of power. Even listening to lies, distortions and inventions of all kinds about Trump the people did not swallow the bait. Hillary raised $ 687 Million in her campaign, mainly with contributions from large corporations. While Trump raised $ 306 Million being mostly from citizen contributors, plus the millions of his own pocket1 . Who do you thing has the popular support? The election fo Trump is a big, fat, F.U. to the whole corrupt political establishment and big corporations in control of much of our lives. An FU to President Obama and all his demagogic policies such Obama Care that supposedly would be more affordable, and is not, now imposed on all citizens. An FU to those who make a living of off welfare. An FU to perversions like Planed Parenthood abortions funded with public money in a country with a majority of Christian. An FU to Political Correctness that is nothing more than censorship and restriction of Freedom of Speech. According to Michael More2 , “Trump’s election will be the biggest FU ever recorded in human history”. The choice between Trump and Hillary is the choice between the sleazebag who is a hard worker, womanizer, naughty and on the other side the wicked evil genius, who presents herself as moral, friendly and concerned about your good. But what she really wants is to use you as means to achieve her selfish, immoral, repulsive, decadent, vile, indecorous, cruel, and disastrous goals. In my opinion, the choice was easy. Trump could not be more imperfect when viewed as a person but is an embodiment of the working people revolts, taxpayers, law-abiding honest citizens, responsible folks, and heads of household. The so-called Silent Majority spoke! In the electoral college, the result was Trump 306 X Hillary 228, a historical beating! 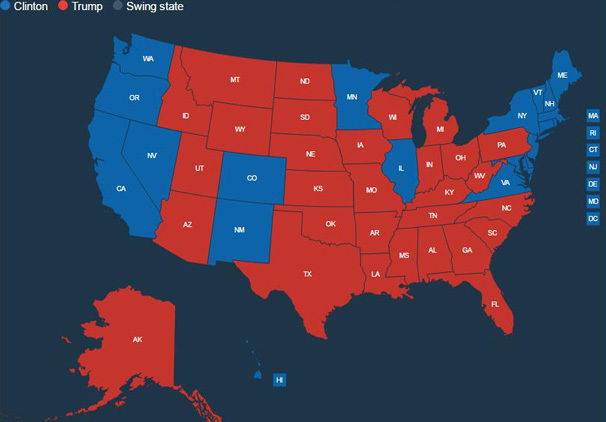 In the map by counties, it is possible to see how the victory was really homogeneous all over the country. Although the press has little or no coverage, there have also been elections for the Congress, Governors, and some state referendums.Bless the uninformed innocents. Republicans won the majority in the Senate and House, so today they have control of Congress and the Presidency. Bless the uninformed innocents. Republicans won the majority in the Senate and House, so today they have control of Congress and the Presidency. This was a historic sign of people’s rejection of the Democratic Leftism. 2 Michael Moore: American movie maker. 3 Olavo de Carvalho: Brazilian Philosopher.